Originally when I started this fitness thing my goals were pretty simple. Lose weight. Specifically, I wanted to get to a “normal” BMI which, for me, is a maximum of 184 pounds. I reached this goal through a combination of diet and exercise, primarily in the form of running. After reaching that initial goal, I changed my focus from BMI to body fat % with the idea that something in the neighborhood of 15-16% would be fantastic if I could do it. I figured 175 pounds would put me in the neighborhood. As I learned more about fitness and my weight continued to fall, it occurred to me that 15% body fat can look radically different depending on the amount of lean body mass a person is carrying. 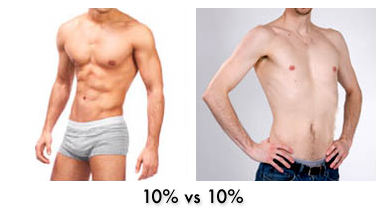 For example, consider the image to the right of two different men at 10% body fat. Given the amount of cardio (running) and complete lack of strength training I was doing, I was heading towards a physique like the fellow on the right. Granted this is certainly better than where I started, but I kind of think the guy on the left looks better. To get there I was going to need to begin focusing more on strength and less on cardio. I initially started resistance training while on a calorie deficit because I still wanted to reach my goal of 175. Although it’s not as great of a deficit as I was back at my peak of around 1,600/day. I figured I would try to eat at maintenance on lift days, and less on rest days. The effect has been that neither of my goals are progressing very well. However, during this period of increasing LBM you’ll likely increase fat as well. Typically this “bulking” phase is followed by a “cutting” phase where the goal is to maintain LBM gains while eliminating the fat gained in the bulking phase. It’s a bit complicated. Since my strength progression is already starting to slow and, in some cases, stall, I’ve decided there’s not much sense waiting to lose this last pound since I’m going to have to go through a cutting phase eventually anyway, and likely more than one cycle. Here’s the thing though: it’s a little scary. I’ve been being very careful about keeping my calories intake low for so long, that I’m nervous about increasing them. Recall that it was as low as 1,600 a day and now I’m looking at somewhere in the neighborhood of 2,800 a day! That’s a pretty huge difference in diet. Anyway, I’m going to give this a go for a while and see where it leads me. At the very least it’s comforting to know I can revert back to my old routine if things don’t work out as planned.